The capital city outpost of this well-managed mini-chain is a popular destination for business and pleasure. 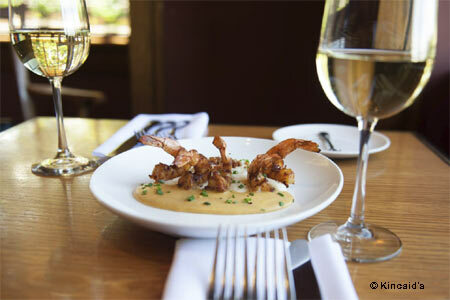 : Service-minded Kincaid's is the place for a business lunch, a pre-concert dinner or a late-night drink. There are no surprises on the classic all-American menu, just solidly prepared and well-presented fare, including a wide range of steaks, chops and simple grilled fish, plus, fresh oysters, a potent Caesar salad and a long list of small plates (crab-filled deviled eggs, Buffalo-style prawns, five-spice seasoned calamari, and mini-burgers among them). Beef lovers should not overlook the sea salt-crusted prime rib, which is the kitchen's specialty. The handsome bar is a cozy refuge to enjoy a well-shaken martini, and the bigger-is-better desserts are meant to be shared---with relish.